Ryn Gargulinski is a writer, artist and performer whose journalism career began in 1991. Credits include two illustrated books, "Bony Yoga" and "Rats Incredible"; fitness, animal, crime, general news and features for various publications; and several awards. She holds a Master of Arts in English literature and folklore and a Bachelor of Fine Arts in creative writing with a French minor from Brooklyn College. When your teeth and face hurt you are likely to run the dentist – but the dentist is not always the right person for the job. While a number of tooth ailments do lead to tooth and face pain, a problem with your teeth is not always at fault. A trip to the dentist and doctor is the ideal remedy, as a host of other ailments can be behind the pain. 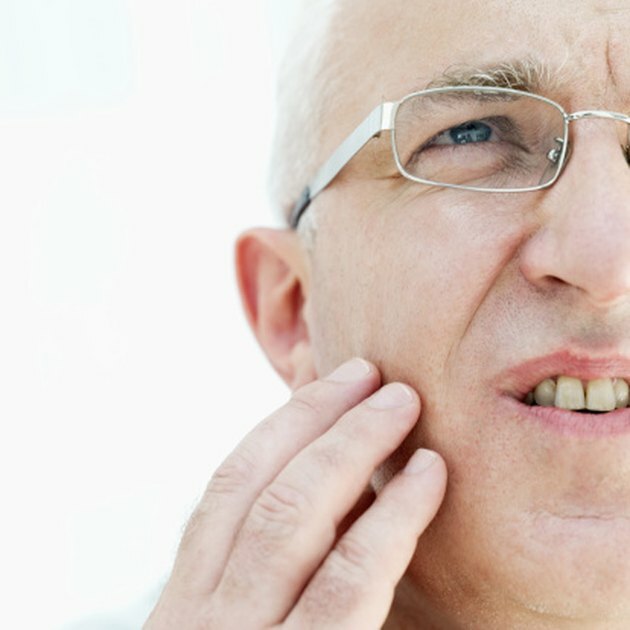 Tooth and face pain often stem from something wrong with the teeth. Teeth that are broken, cracked or have a cavity or exposed root can lead to pain, as can gum disease. As the pain often spreads throughout the jaw and face, finding which particular tooth is at fault is sometimes tough. Pain from ailments affecting the teeth and gums range from a sharp, sudden sting to a dull, throbbing ache. Facial migraines are sometimes behind face and tooth pain, according to the Trigeminal Neuralgia Association. Such migraines result in a pulsating, throbbing pain that feels like an ice pick is attacking your facial area. Facial migraines usually hit the teeth as well as the gums, cheeks and nostrils. People suffering from facial migraine attacks, which can last for days, are extremely sensitive to light and noise and often also suffer from nausea. A number of nerve ailments often cause severe face and tooth pain, the Trigeminal Neuralgia Association and endodontist Joseph Dovgan say. One of the most common is trigeminal neuralgia, or TN, which stems from a disorder of the fifth cranial nerve, also known as the trigeminal nerve. Pain from TN can be as brief as a second or two, but it is usually excruciating. The pain also sometimes disappears for months, only to suddenly return. Other neuralgias produce similar agony and also often lead to tooth and face pain. Sometimes the facial muscles are behind tooth and face pain, the Trigeminal Neuralgia Association explains. People who grind or constantly clench their teeth often end up with an achy, dull pain in the jaw, as do those suffering from arthritis, facial muscle tension, misaligned teeth or even stress. Those suffering from such pain, known as myofascial or temporomandibular pain, often cannot open their mouth all the way and experience increased pain whenever they chew. Sinus infections often lead to face and tooth pain, as do a number of other ailments, the Trigeminal Neuralgia Association and Dovgan note. These include temporal arteritis, which is a chronic throbbing of the artery near your temple, cluster headaches and cluster nerve tics, both of which cause searing pain on one side of the face. Another possible cause is atypical odontalgia, with its overall constant face and teeth pain that frequently gets worse when you chew, eat or otherwise stimulate your teeth. How Does a Toothache Give You Headaches?